Jayaram Jayalalithaa, Chief Minister of Tamil Nadu, passed away at 11.30 pm on 5 December in Chennai after a 73-day long hospitalisation. Jayalalitha was a reluctant entrant to movies and politics, but she succeeded in both, becoming Tamil Nadu’s Chief Minister for 6 terms. A brilliant student. A mega-movie-star. An irrepressible politician. A beloved leader. A lifelong fighter. R.I.P. J Jayalalithaa. Knappily gives a tribute to the irreplaceable ‘people’s leader’. 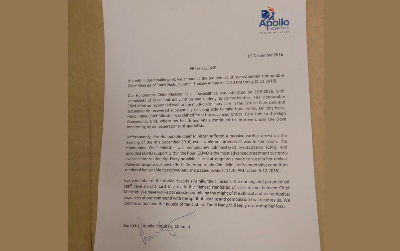 At around midnight, Apollo Hospitals, Chennai, issued the press release which Jayalalithaa’s supporters hoped they will never have to read. It announced the demise of Puratchi Thalaivi (Revolutionary Leader) Amma, Selvi J Jayalaithaa, at 11:30 pm on 5 December 2016. Jayalalithaa’s health took a turn for the worse when she suffered a cardiac arrest on Sunday evening at the Apollo Hospitals, Chennai, where she had been undergoing treatment since September 22 for dehydration and fever. She has been on extracorporeal life support since then. In a cruel twist of fate, this happened right after Apollo Hospitals expressed confidence that Amma could be released soon. After more than 50 days in the hospital, Ms. Jayalalithaa, in a signed letter, had said that she has taken a “rebirth” and that she was waiting to get back soon to routine official work. Now, her mortal remains are being taken to her residence at Poes Garden. She has died without a political heir. Her party, the AIADMK, will struggle to find stable and able leadership. It is eerie how closely 2016 resembles 1987, when MG Ramachandran died suddenly without an heir, and Jayalalithaa rose to prominence. Why did Jayalalithaa take to movies? Neither she wanted to become a political leader, nor did she want to become a movie star. It was destiny that made her choices - but she followed through as strongly as anyone could. An academically brilliant student, she took to movies to help her family with finances. Born on February 24, 1948, in a family that served King Jayachamarajendra Wodeyar of Mysore, she was named Komalavalli at birth after her paternal grandmother, in line with her community's customs. She was given the name Jayalalithaa at the age one, named for the houses of her grandparents where she lived - Jaya Vilas and Lalitha Vilas. She lost her father when she was just two, and her mother, Vedavalli, left to live with her parents in Bangalore, taking Jayalithaa and her brother, Jayakumar, with her. Jayalalithaa started school at the elite Bishop Cottons Girls School and Vedavalli moved to Madras to start acting in plays, and subsequently films, under the stage name 'Sandhya'. This was the only way she could support her family, and when the time came, even her daughter, Jayalalithaa would enter the film industry - not for its glamour, but to make ends meet for her family. Jayalalithaa moved to Madras in 1958 to live with her mother, after her aunt got married. She was enrolled in the Sacred Heart Presentation Convent, popularly known as Church Park, where she excelled in academics. She was also trained in Carnatic music and Bharatanatyam and Kathak. She makes her film debut in a lead role in 'Chinnada Gombe', a Kannada film in 1964. To be factually correct, Jayalalithaa’s first film was an English language film titled Epistle, which released in 1961 when she was only 13. The film was directed and produced by Shankar Giri, the son of the former President of India, Dr V V Giri. Aged 16, to support her debt-ridden family, Jayalalithaa gave up on her dreams of becoming a lawyer and plunged into the film industry. Though reluctant to work in films initially, the young actress soon took the cinema world by storm. Jayalalithaa's Tamil film debut came in the landmark blockbuster hit, 'Venniraadai' in 1965. In the same year, she starred in a film, 'Aayirathil Oruvan', with Tamil cinema's biggest star MG Ramachandran (MGR) - who was almost thrice her age - for the first time, to begin what remains among the most successful screen pairings in Tamil cinema, as well as one of the most critical relationships in her life. She was trend-setter in movies (as she would be in politics decades later). At a time when heroines appeared demurely clad in saris on screen, Jayalalithaa started the trend of wearing short-sleeved dresses, skirts and tight pants. She knew her steps. An excellent dancer, Jayalalithaa was trained in Bharat Natyam, but was equally proficient in Mohiniaattam, Kathak and Manipuri. She could sing too - after all she was trained in Carnatic music. She sang several songs in her own films, such as Amma Endraal Anbu in Adimai Penn (1969), Naan Endral Athu Naanum Avalum in Suryakanthi (1973) with S P Balasubrahmanyam, and Chithira Mandapathil in Anbai Thedi (1974) along with T M Soundararajan. She never gave up on reading the classics of English literature. Even as an actress, she would always carry books with her to the studio, and would sit quietly by herself in a corner and read between shots. Between 1965 and 1980, Jayalalithaa was at the peak of her film career. She was among the highest-paid actresses in the country at the time, and endorsed top brands. In this period, she acted in over 140 films, of which about 120 were blockbuster hits. She starred in 28 box-office hit films with M.G. Ramachandran between 1965 and 1973. She worked with Sivaji Ganesan in 17 films, of which 15 were declared golden jubilee hits. Goodachari 116, the first spy film in Telugu, starring Jayalalithaa and superstar Krishna, became such a smash hit that many sequels to the film were made in later years. By the way, Jayalalithaa also acted in one - just one - Hindi film. This was the 1968 film titled Izzat starring Dharmendra and Tanuja. She played a spunky Adivasi girl, Jhumki, in love with Dharmendra, who is far above her socially. Her feisty role in the film earned her much appreciation and also showcased her dancing talent. In 1970, Jayalalithaa had a falling out with MGR, after he chose to work with another leading lady. She starred in a movie with MGR for the last time in 'Pattikaattu Ponnaiya', a year after MGR split from the DMK to launch the AIADMK in 1972. Jayalalithaa revived relationship with MGR only in 1981. Jayalalithaa steped away from films in 1977. She starred in a Tamil movie, 'Nadhiyai Thedi Vandha Kadal', for the last time. Her last film in a leading role however was the Telugu film 'Nayakudu Vinayakudu'. If we count special appearances too, then - and how many actors in this world get to do this - in 1992, when Jayalalithaa was the Chief Minister of Tamil Nadu, she made a brief appearance in a film titled Neenga Nalla Irukkanum, in which she portrayed herself. There are people who become successful. 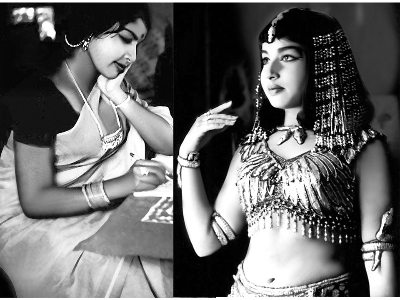 Jayalalithaa became as successful as any actor could in India during those days. Then there are successful people who succeed so much more that the past appears ordinary. Jayalalithaa would go on to become a political juggernaut - and dominate Tamil Nadu politics for more than two decades. When did she enter politics? Jayalalithaa joined MGR's AIADMK in 1982 and soon after delivered her maiden political speech "Pennin Perumai" ("The Greatness of a Woman") at the party conference. She went straight to the top echelons of the party as propaganda secretary, much to the annoyance of many seasoned party men. She was elected to the Rajya Sabha in 1984, as MGR wants her there for her fluency in English and knowledge of several languages. She remained a member of the Rajya Sabha till 1989. 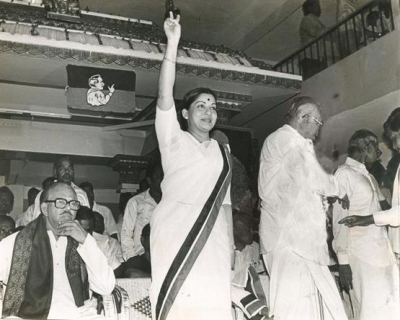 She became a key campaigner for the AIADMK and the party won a massive election victory despite MGR remaining hospitalized through the campaigning. Her rising prominence troubled senior hands in the party. Her attempt to be named interim Chief Minister also did not go well with MGR. MGR sackd Jayalalithaa in 1986 from all party posts after she formed a parallel political outfit. However, she continued as Rajya Sabha member of the AIAMDK. MGR died in 1987, leaving no clear political heir. AIADMK descended into chaos over his legacy. Jayalalithaa competed with MGR’s widow Janaki for control of the party. The party splits into two major factions, one behind each woman. The Assembly election in 1989 saw the Jayalalithaa faction win 27 seats to the Janaki faction's two. Janaki steps aside to clear the way for Jayalalithaa's accession to MGR's legacy. Jayalalithaa becameTamil Nadu's first woman Leader of Opposition. During the budget session, she was assaulted in the Assembly Hall and a senior DMK leader attempted to disrobe her. Jayalalitha drew a parallel with the shameful disrobing of Draupadi in the epic Mahabharata. She vowed she will not return except as Chief Minister. She would keep this vow. Allied with the Congress, and rocketed by the sympathy wave following the assassination of Rajiv Gandhi, Jayalalithaa stormed to power in 1991 as Chief Minister of Tamil Nadu for the first time. 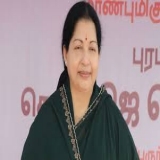 However, during the five-year term, her popularity took a hit because of her perceived high-handedness, allegations of corruption among party cadre and the opulent display of wealth in the wedding of her foster son Sudhakaran, a nephew of her close aide, Sasikala Natarajan. AIADMK was routed in the 1996 elections. The DMK government filed a slew of corruption cases against her. She was arrested and remanded in prison in a corruption a case, which she would be acquitted of in 2000. Subramanian Swamy, then the chief of Janata Party filed disproportionate assets case against her. She would have to fight these cases for the rest of her life. AIADMK won 18 of Tamil Nadu's 39 Lok Sabha seats as part of the NDA, and became part of the Vajpayee government at the center in 1998. Jayalalithaa pulled out of the NDA government in 1999, amid growing disagreements on several issues. AIADMK, now allied with the Congress, lost seats in the 1999 elections. NDA, now including DMK, came back to form government at the center. Jayalalithaa was convicted in 2000 in the Pleasant Stay Hotel case and the TANSI Land Acquisition case. Though the conviction was stayed, the court barred her from contesting the Assembly elections the next year. AIADMK alliance, however, swept the 2001 Assembly elections, winning 196 of 234 seats. Jayalalithaa was sworn in as Chief Minister amid controversy over the pending results on her convictions in the TANSI and Pleasant Stay Hotel cases. The Supreme Court struck down Jayalalithaa's appointment as Chief Minister. Her loyalist O Panneerselvam was appointed Chief Minister, a post he occupied for about six months amid accusations of being a puppet (this ‘puppet’ remained loyal to her till the very end and may become the Chief Minister now, all on his own). About this time, she added an 'a' at the end of her name for numerological reasons. That extra ‘a’ probably worked. The Court overturnd her convictions in both the cases. The stage was set for the irrepressible Jayalalithaa to return as Chief Minister. Where did her political fortunes keep swinging to? 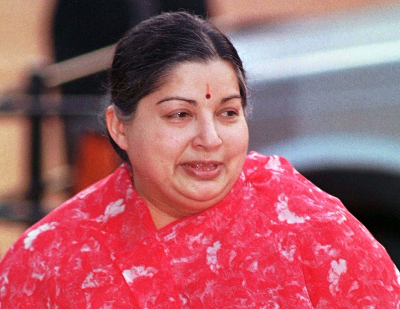 In March 2003, Jayalalithaa resumed charge as Tamil Nadu Chief Minister. Jayalalithaa took a strong stand against over a lakh striking government employees. She used the Tamil Nadu Essential Services Maintenance Act (TESMA) to quash the strike, threatening suspensions and dismissals for those government servants who don't report to work. India's first company of female police commandos was set up in Tamil Nadu in 2003. They underwent the same training as their male counterparts, covering the handling of weapons, detection and disposal of bombs, driving, horseriding, and adventure sports. Meanwhile, the Supreme Court shifted the Disproportionate Assets Case against Jayalalithaa to Karnataka, to ensure fair trial. AIADMK was wiped out in the 2004 Lok Sabha elections; the loss was attributed to anger of government servants and other sections of society. AIADMK won 61 seats and lost the 2006 Assembly election to DMK-led alliance comprising most of Tamil Nadu's political parties by a slender vote margin. In 2009, Jayalalithaa, now part of the Third Front, was unable to stop the DMK-Congress combine from winning a majority of the seats for the UPA. AIADMK-led alliance swept the 2011 Assembly election, winning 203 of the 234 seats. AIADMK alone won 150 seats to form the government. Her government started implementing several populist and socialist schemes. AIADMK wins 37 of Tamil Nadu's 39 seats in the 2014 Lok Sabha elections, becoming the third largest party in Lok Sabha, just behind Congress's 44. Setback again, this time a legal one. In September 2014, a Bengaluru-based trial court sentenced Jayalalithaa to four years in jail and Rs 100 crore in fines. The conviction automatically in the Disproportionate Assets Case disqualified her as Chief Minister of Tamil Nadu under a recently passed law. She was jailed at the Parappana Agrahara prison complex. Again, O Panneerselvam took her place. After about a month in jail, she was granted bail by the Supreme Court. On May 11, 2015,: Jayalalithaa was acquitted of all charges in the Disproportionate Assets Case by the Karnataka High Court hearing the appeal against the trial court verdict. 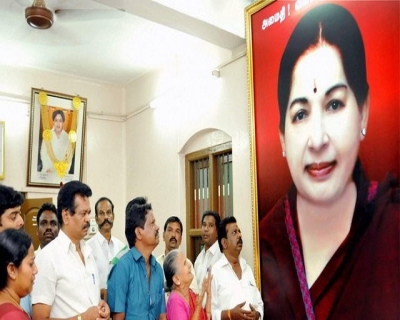 She returned as Tamil Nadu Chief Minister soon after. The latest victory was probably her best. Fighting the May 2016 Assembly election by herself, Jayalalithaa rewrote history by becoming the first Tamil Nadu Chief Minister in 32 years to be voted back to power. AIADMK won 134 of the 234 seats to retain power. And now she is gone forever. There will be no return. O Panneerselvam, who is a rare example of unflinching loyalty in this age of fickle and opportunistic politics, will most likely lead the party now. Only this time he will not have Amma’s guidance. Only this time he will have to ensure his party members remain loyal to him as they were to her. 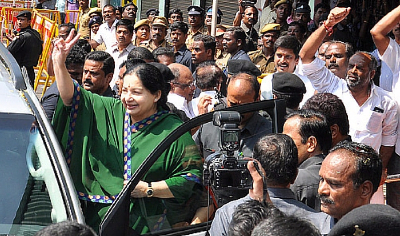 Who benefited from the ‘Jayalalitha model’? Jayalalithaa’s governance and policies may have been politically and economically unsound for experts and analysts but for the common man, her manifesto of freebies as well as improvements in the power sector gave them a breather. Besides controlling law and order and improving the power sector — both ignored during the previous DMK regime — Jayalalithaa managed to streamline the system without too much of a burden on the people — despite the governmental debt of over Rs 80,000 crore. Her freebies over the last five years also helped the people. These include four goats and a cow to each BPL family, mixer-grinders and fans, free uniforms (3 sets), school, bags, notebooks, geometry boxes, etc., for all children in government schools, and cycles and laptops for Class 11 and 12 students. Also, in a state where more than half the voters are women, six lakh women received four grams of gold and Rs 50,000 as marriage assistance. Jayalalithaa also distributed 20 kg free rice every month. Free sanitary napkins, breast feeding shelters and Amma baby care kits were given as a gesture of love for many women. Those who laugh at the Amma model and Tamil Nadu’s freebies don’t take into account that a college student takes his free Amma laptop to the class without removing the Amma sticker on it. For the poor people of Tamil Nadu, freebies are a welcome gesture and they didn’t think they could expect anything better from any of the other parties. It is the poor who benefitted and - it is indeed the poor people, mostly women, who are inconsolable at the death of their Amma. How should we celebrate the life of Selvi Jayalalithaa? J Jayalalithaa was the only man in the AIADMK. Without a sexist undertone, she was widely believed to be an effective Chief Minister and an authoritative Party leader. She single-handedly kept her party-men in line. To understand the importance of her journey, one must pay attention to the fact that she was a political leader without dynastic influences, in the Tamil Nadu context this is remarkable. It wasn’t easy for a woman, without prior political experience to do what she achieved. She should be remembered for being a secular leader. Although caste undertones were strongly present in her rule, they can probably be forgiven as indispensable to electoral politics in India. Cult sentiment and feet-darshan aside, Jayalalithaa was a well-respected politician not just among the people of Tamil Nadu and her well-wishers, but also across the country, and most importantly across party lines. Her policies though populist found takers within the lower rungs of society; it was easy to overlook her schemes as being propaganda, a means to an end or even just legal bribery – but to the common man and women, laptops and scores of kitchen appliances took her from being perceived as a public representative to being a revered divine-like figure. She was a champion of the popular ‘ladies sentiment’. Chest beating, wailing women grieving over her demise have not been paid to act; there is a genuine sense of loss. Her schemes and policies were geared towards betterment of the Tamil woman, from the Amma canteens to the self-help groups – women were an integral part of her governance. She should be remembered for her resilience. To beat the anti-incumbency sentiment, to come back into power case after case, is not a mean feat. It is important to keep in mind that her political opposition at the time was very well established when she took over the divided party, AIADMK, after MGR’s death. The Party is what it is because of her. Jayalalithaa should be celebrated for her achievements. Her story of poverty to politics is not new in the Indian scene, but in a society that is inherently patriarchal and sexist, her achievements are nothing short of phenomenal. She will continue to dominate the political scene even after her death, the legacy she leaves behind may not pull the AIADMK through the new challenges but it will definitely play a role in electoral politics. Don’t expect the stickers on laptops, and portraits on public utilities to disappear anytime soon. They cannot win an election without Amma, even after she is gone. The familiar face in the white tempo will no longer brighten the lives of passers-by who wait for hours to see her smile. The loss will continue to haunt Poes garden and Fort St. George but life and politics will go on, as they inevitably do. It is important to remember that Jayalalithaa came into power in a similar situation after MGR’s death in 1987, even though there might never be another ‘Amma’ to rise in 2016. She has set an eternal example for successive generations to look up to.